Partners have a year to prepare for Cisco’s transformation, and their own. The entire transformation will take two to three years or more. CISCO PARTNER SUMMIT — As a traditional infrastructure company, we’ve all heard Cisco talk about its shift to software. The company on Wednesday put its stake in the ground and homed in on its transformation road map, as it shifts from where it is today to where its headed. As Cisco outlined the steps in its transformation journey, it simultaneously clarified what partners need to do today and over the next 12 months to align with the company. “Today is about Cisco’s go-to-market strategy,” Gerri Elliott, executive vice president and chief sales and marketing officer, told attendees at the day two keynote session, at Cisco Partner Summit 2018. That strategy starts “outside in,” beginning with the customer. Elliott focused on three points: the opportunity and must wins; connection and alignment; and impact. Cisco wants to be all-in with customers and wants partners to sell the vendor’s end-to-end solutions, whether that’s around network architecture, the data center, security or collaboration. To incentivize partners, Cisco will enhance its DNA Activation, for example. When it comes to IoT, Cisco has its IoT architecture and will enable partners with a new IoT certification program. Elliott talked about the four elements in its go-to-market strategy: Cisco’s sales organization caring for its customers; partners who complete and deliver Cisco solutions; the marketing organization, which is responsible for creating demand; and the customer experience organization, responsible for ensuring that customers derive the most value from Cisco’s solutions — and the need for them to be connected and aligned. New to Cisco and tasked with running the newly formed joint sales and marketing organization, Elliott explained the big changes happening in the sales organization. “This year we’ve been refining our sales strategy to be more consistent and deliberate in terms of who we sell to, what we sell and how we show up,” she summarized. She also introduced new geography lead executives and expanded team. On the partner front, she wanted attendees to know that as Cisco incents its sales teams and enable its sales teams to drive more recurring revenue – software adoption, renewal and expansion – Cisco will do the same for partners. “We want our sales incentives and our partner incentives to be completely aligned and connected — that’s our commitment to you,” said Elliott. Karen Walker, chief marketing officer at Cisco, outlined the three things that partners will see marketing do: The first is simplify the naming of the portfolio. Why that matters? According to Forbes, 70 percent of customers are more likely to recommend a business if they understand what it sells. She admitted that the simplification process will be a multiyear journey, but Cisco’s goal is to eliminate complexity and confusion in its portfolio brands and names. The second thing marketing will do is have fewer and bigger moments. Forget about having 43 product launches in 52 weeks, which is confusing to everyone and results in Cisco competing with partners. Now, it will launch products three to four times a year around Cisco Live and Partner Summit, creating a powerful and predictable rhythm for the business. Taking a page out of this new book is why Cisco launched its new brand campaign – The Bridge to Possible – and SD-WAN campaign, this week. Finally, she addressed driving demand — that means driving demand for partners, enabling them, and driving demand with partners. What that will look like to partners: getting more leads from Cisco, and with a new combined sales and marketing organization, partner response will be fast: 15 minutes. Cisco enablement, such as Partner Marketing Central, in the partner hub, will soon include new campaign materials. And Cisco wants to tell partners’ stories, so marketing wants partners to send their stories about working together. Cisco also has a new customer experience (CX) strategy — and it’s big. “We have to think differently across the entire business — how we build our products, how we sell our products, how we get our customers to adopt, use and love our technology,” said Elliott. Gartner predicts that by the year 2020, CX will be the most competitive differentiator for businesses — not product or price. “If we get this right, it unleashes so much opportunity for us in recurring revenue and uplift in services for you,” said Elliott. Before introducing the powerhouse leader for CX at Cisco, Elliott touched on the third point in the company’s go-to-market strategy – Impact – noting that Cisco is measured, in part, by what it does with its resources and assets. Elliott introduced the new Talent Bridge for Veterans program that trains veterans and helps them find jobs at Cisco and with its partners. She encouraged partners to get involved and that information is available in the Partner Hub. To oversee and drive Cisco’s CX strategy, the company needed big talent. The woman for the job is Maria Martinez, executive vice president and chief customer experience officer. Martinez oversees Cisco’s $12.5 billion services and customer experience organizations. These organizations are responsible for helping customers to transform their businesses through Cisco’s broad portfolio of software, subscription and services offerings. Under her leadership, Martinez is helping to drive Cisco’s overall sales and go-to-market transformation to deliver greater business outcomes for customers as they transform their businesses. Her leadership experience is vast and deep, having held top positions at Salesforce, Microsoft, Motorola and AT&T — and that’s just getting started. She brings 40 years of experience to her job at Cisco. Martinez, who joined Cisco three months ago, outlined to partner attendees how Cisco is going to enable them to help customers adopt, use and love Cisco technology. She outlined three to-dos: Be customer obsessed; be the trusted experts; and be extraordinary together — one team with Cisco, no seams. Get that right and customers can feel it, they will trust Cisco and its partners, and they’ll be loyal. CX is a philosophy, a team and a portfolio. It means that Cisco will have to do things differently than it has in the past. A new revenue model will address: accelerating recurring revenue growth, annual recurring revenue, incremental annual recurring revenue, and attrition. She talked about the restructuring of the organization and team, led by leaders such as Oliver Tuszik, the new global channel chief, but also locally and regionally, all aligned to work together and with partners. Her focus then turned to the present, reassuring partners that there won’t be any program, portfolio or incentive changes and that anything new will be introduced incrementally. She explained that CX offers partner growth today. “We’re going to continue doing the support services. Our goal is to drive attach and expand; we’re going to focus on the business-critical services, and we have some life-cycle programs, such as Lifecycle Advantage and Lifecycle Advisor that are getting good feedback — and we’ll continue those,” she said. Cisco will build on these so partners don’t think that the investment they make today is at risk, Martinez added. As future initiatives are shaped, CX wants partner involvement. “As we reimagine portfolio services, as we introduce tools, telemetry, analytics and we create a new engagement model, we want to do that with you,” Martinez said. The goal is to create opportunities at every pit stop (Cisco used a race track analogy) and incrementally. There will be new opportunities for partners to increase services and product sales, to differentiate, and for partners to expand their portfolios to capture predictable life-cycle incentives. Today, CX is building what it calls Lifecycle First together. That includes new CX portfolio introductions with continuous engagement and trials; new CX certifications and specialization; and new CX incentives. Martinez talked about the first new CX Enterprise IBN offer which will be packaged in three levels in six months. More to come on this from Cisco. The Customer Experience Lifecycle First timeline begins with the unveiling of the strategy this week. 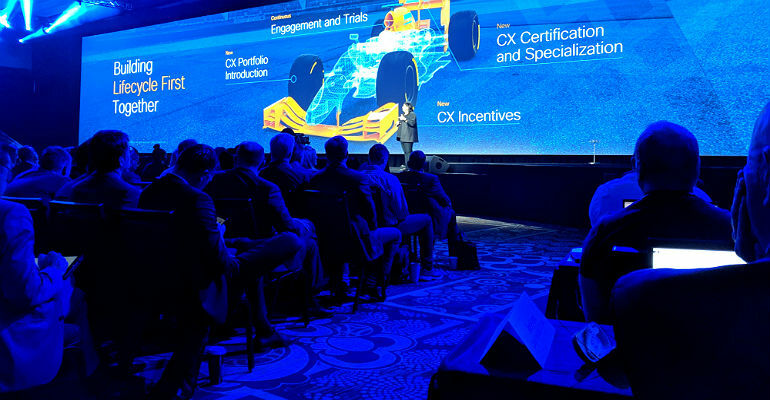 That will be followed by CX certifications and specializations, a CX Enterprise IBN offer, and culminate in the CX portfolio and incentives at Cisco Partner Summit 2019. From this event to next year’s, there will be engagement and trials. Partners have a year to prepare for Cisco’s transformation and their own. The entire transformation will take two to three years or more.